December 10, 2010 4:18 pm By Lori Post contains sponsored/affiliate links and I get commissions for purchases made from links. As an Amazon Associate I earn from qualifying purchases. As part of the Walmart $5 Gifts from the Kitchen Challenge, I have been taste-testing a variety of “in-a-jar” recipes to find the most scrumptious. Yesterday I shared the recipe for Cranberry Hootycreeks HERE. 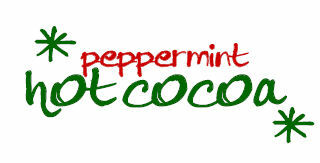 Next up on the list, Peppermint Hot Cocoa! Create a tag with the following instructions for recipient. Or use mine HERE. Using coupons, I paid $6.24 for all the ingredients I needed to make three jars. If you don’t have any quart jars on hand, you can often find them in thrift stores, or get a 12-pk for around $9.50. 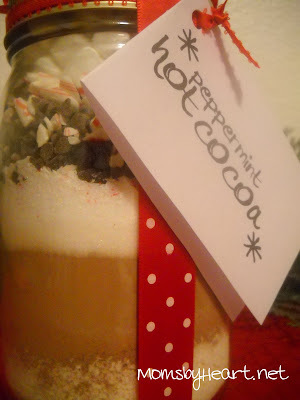 Total cost per jar: $2.87! You have made my day! this is my favorite. I did not know I could make it myself. Thanks!